The National Community Energy Strategy is intended to be a high-level plan for any actors – government, community or business – interested in growing a vibrant community energy sector in Australia. to take up and work on. All readers are encouraged to use this strategy and its priority initiatives to guide their work and to contribute to a more supportive context for community energy. The partner organisations in this project are also the founding members of the Coalition for Community Energy (C4CE). C4CE has been established as an action-based coalition, founded on collective impact principles underpinned by a collaborative governance framework. C4CE is open to any organisation or group who shares a vision for a vibrant community energy sector and is interested to collaborate on priority initiatives that bring mutual benefit to their group/organisation and the wider sector. The National Strategy is intended to be the shared agenda that guides the joint activities of C4CE members. Clearly it is beyond the scope for any one organisation or coalition to deliver all of the above priority initiatives. While C4CE will action some, the best outcome would see many actors contributing to the delivery of the aspects of the National Strategy that fit with their interests and skills. If one or more priority initiatives or objectives outlined in this Strategy resonates with your organisation or group, or seems similar to something you are already working on, we invite you to contact the C4CE Secretariat on secretariat@c4ce.net.au. C4CE is looking to put groups working on similar ideas in contact, to realise any potential for collaborations and/or shared learning outcomes and increase impact. A strategy is only useful if it is implemented and updated. As such, a monitoring and evaluation framework has been developed that provides the metrics to track the progress of the wider community energy sector as well as progress towards the vision, objectives and priority initiatives outlined in this Strategy. 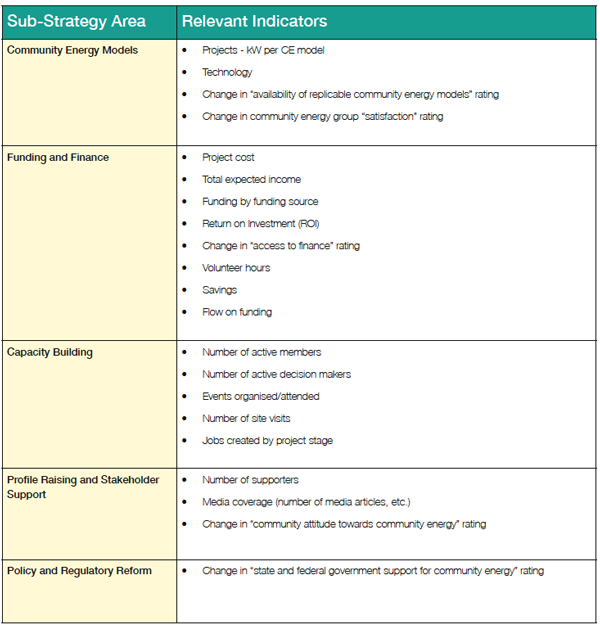 A full collective impact assessment of the community energy sector, including indicators and recommendations of how to institute shared measurement and monitoring processes is provided in Appendix C.
Table 2 outlines a list of key indicators for each of the sub-strategies, drawn from the key and optional community energy impact indicators in Appendix C.
Appendix B provides a specific status update and suggested next steps for all of the priority initiatives identified in this strategy. It is intended that Appendix B be updated as part of the C4CE annual reporting process. Monitoring and evaluation is also useful as it can lead to adaptation of the approach taken. The National Community Energy Strategy is intended to be a living document that is updated based on emerging opportunities and needs. As such, part of the core-business of C4CE will be to update the National Strategy annually or bi-annually as necessary, in part based on the results of the shared monitoring and evaluation processes and in conjunction with the delivery of the bi-annual Community Energy Congress. In addition organisations undertaking initiatives identified in this strategy will be encouraged to align initiative monitoring and evaluation with the process and indicators outlined in Appendix C.